Yes, colleagues, galaxies collide too. Although space, the universe / visible) seems very large, huge and gigantic, gravity is one of the most important forces although, depending on which theory affects some strings that, in ours, has little weight. 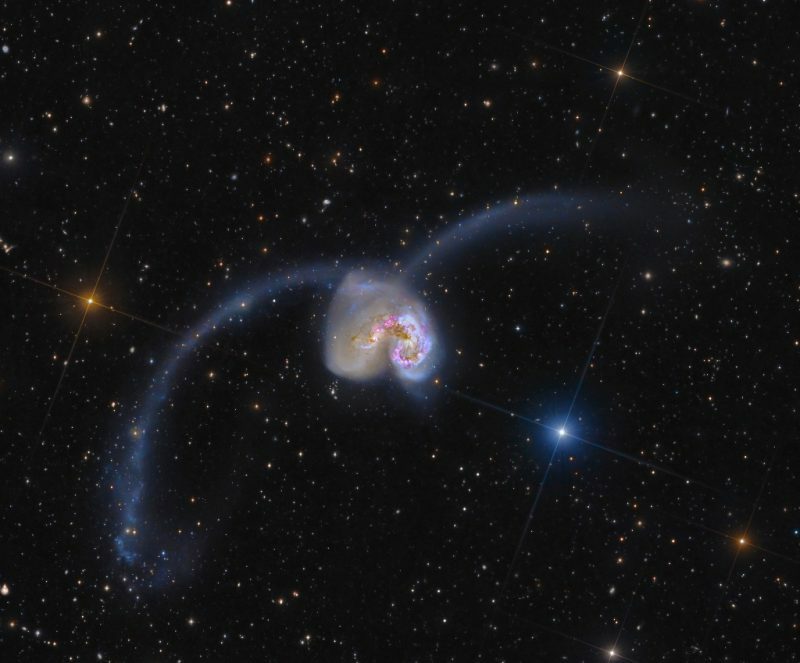 That is why in the image you see the collision between NGC 4038 and NGC 4039, two very molten galaxies that in a few thousand years are one and have been “beating” for several thousand years. Although it seems a disaster of “universal” proportions and reminds you that when the Milky Way joins Andromeda within about 6000 million years and that we will stay with LactoMeda (the new galaxy where humanity will live … or not) , To solar systems within any of these two galaxies, the collision will not be as important or strong. And all, thanks also to the gravity that will make sure that the stars, in themselves, do not collide. From the shock that is happening, to emphasize in itself as you see the gas and the dust, the things that weigh less and that by gravity can be moved more easily and quickly, extend and get very high speeds. Something very fun and worth seeing. Actually, clashes between galaxies are elastic collisions and what must be considered in the formation of the cumulus is the mass center of both. That is, they are treated as a lifelong elastic shock except for the central black holes which, by gravity, will suffer an inelastic collision by losing all their kinetic energy and passing to electromagnetic energy, heating the gases and dust of both galaxies. Apart from that, when the black holes join, they will launch a gravitational wave of important size, such as those detected by LIGO. In short, what you see in the photo is Antennae, in the constellation of the Crow (or Corvus) and that the excess of infrared radiation that is detected is just that, the union of these two constellations. Unfortunately this shock can not be seen with the naked eye or with binoculars and a telescope is necessary.